The ZenWatch 3 is a fantastic looking timepiece, but when it comes to customizing the bands, it just isn’t possible. Thanks to ASUS’ use of a proprietary system, owners cannot easily swap bands like they can on other Android Wear devices. Enter the latest Kickstarter campaign that hopes to change all of that. 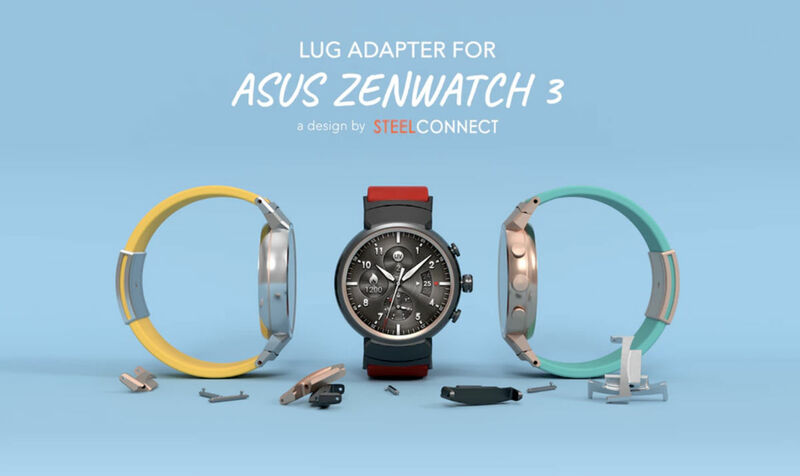 Introduced by SteelConnect, makers of many smartwatch adapters, the AZ3 is a simple adapter that fits perfectly into the lugs on the ZenWatch 3, which then allows you to attach regular 22mm bands and straps. It’s a very simple process, one that will solve many of the gripes I hear about this particular smartwatch. As for the campaign itself, SteelConnect is looking to raise just under $6,000, which is nothing compared to other campaigns we’ve seen on the service. There are still early bird rewards to claim, priced at under $30, which will net you an adapter for your ZenWatch 3. If you have this smartwatch and want to start using whatever strap you’d like, head over to Kickstarter and get to backing!